In recent years, basketball fans and writers have shed heavy pixels and ink on the ascendancy of geeks over jocks in pro sports. Heavy number crunching – complete with new stats and endless logarithms – have taken over the games we love. And yet, according to one of the thinkers who sparked the statistical revolution, most NBA teams still don’t know squat about how to win with numbers. David Berri co-authored his now-classic Wages of Wins: Taking Measure of the Many Myths in Modern Sport nearly a decade ago. His work has focused on understanding which statistics most impact the desired outcome: winning. 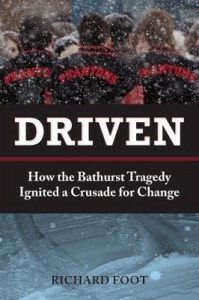 Driven: How the Bathurst Tragedy Ignited a Crusade for Change by Richard Foot – A magazine assigned me this book to review. I’d never have read it otherwise. To my surprise it was really well written, touching and informative. It had many insights about the nature of social change and how different people respond to tragedy. If I weren’t a parent I might not have found it so powerful. “Great Wall” is a short story commissioned by Halifax playwright and actor Michael McPhee as part of the Doppler Effect’s Cadimus Protocol, a trans-media art project that imagines a world where “environmental cataclysm forces vigorous regulation of humanity’s procreation rate in order to balance our ecosystem.” So far it includes works of theatre, visual art, music and more. Read “Great Wall” at http://cadimusprotocol.com/great-wall-story/. Author and publisher Lesley Choyce’s workspace offers an escape from the real world—but a window that frames the ocean view is essential. I don’t remember reading The Lorax when I was a kid. I read it to my kid now. But I’m not a Lorax purist.